Have you ever wondered why our nation has the best military in the world today? How is it that we can place young adults into the most sophisticated and expensive weapon platforms ever and accomplish the mission effectively and efficiently with minimal error? Some would say the military has a lot of money, and they are not wrong, however money does not buy discipline, dedication, and desire to win. How does the U.S. Department of Defense (DoD) accomplish this so well you may ask… it starts with self-assessment. The Department of Defense has been a leader in self-assessment for many years. They constantly go through checklists and operating instructions and practice their discipline on a daily basis. The core of their existence is centered around preparedness and seeking the answer to the questions “how do you know?” and “what you do not know?”. I am sure you all would agree with me in recognizing we cannot afford for them to lose at anything. Their ideology has grown into a culture, or in other words, it has been institutionalized. The military culture has been extremely influential to the fire service over the years. In the late 1980s, individuals such as Bill Killen and Jim Hotel used their influence to incorporate accreditation into all DoD training programs and thus revolutionized standardization of training to current National Fire Protection Association standards. State fire training facilities and local colleges flocked to do the same as it made great sense and was a proven way of business. Today, the industry practice is to have an accreditation body (IFSAC or Pro Board) verify and validate training to ensure it meets expectations and standards. This training-focused accreditation requires an organization to self-assess itself first before seeking outside evaluation. The DoD Fire and Emergency Services (FES) has been involved with the Commission on Fire Accreditation International (CFAI) from its onset and first placed CFAI accreditation into DoD instructions in 2000. Chief Bill Killen, Director, Navy Fire & Emergency Services Programs, was one of the architects of the quality improvement model and self-assessment process. His knowledge of DoD culture and commitment to quality improvement helped create CFAI and shape fire departments across the US and Canada for the past 25 years. Every five years CFAI updates the self-assessment model to ensure it is contemporary and meets the needs of tomorrow’s fire service. DoD has been a strong supporter of this and is heavily involved each time. During the 9th edition update, DoD’s influence was noted in their ability to seek a letter of deviation when they cannot meet their Department of Defense Instruction (DoDI). This concept was instrumental in changes Category 2: Assessment and Planning. The DoDI is seen as a statue or ordinance within the civilian world. Civilian fire departments do not have this type of requirement so their Community Risk Assessment-Standards of Cover (CRA-SOC) needs to be approved by the agency having jurisdiction (AHJ). This allows the AHJ to set a response standard for the community, based on risk, and accept risk beyond their financial limits. To understand the impacts of their decisions, performance indicators 2D.8 and 2D.9 ensure the fire departments report gaps in their performance based on their approved CRA-SOC to hold the fire department accountable. CPSE just announced their plans to create the 10th Edition of the CFAI model. CPSE will start the update process by inviting key stakeholders to provide their vision of where to lead the fire service. A representative from the DoD will be attending this kick-off meeting to ensure we are headed in the right direction. Additionally, we will be inviting representatives from the different component services (Air Force, Marine Corps, Navy, Army, and Defense Logistics Agency(DLA)) to volunteer as subject matter experts in the review of all ten categories. 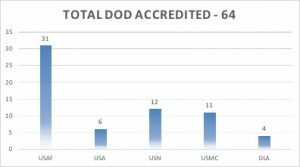 Today, there are 64 DoD agencies accredited through CFAI. 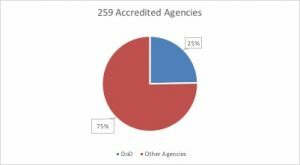 This accounts for nearly one quarter of the 259 agencies currently accredited. The Air Force leads the way with a total of 31 agencies followed by Navy (12), Marine Corps (11), Army (6), and DLA (4). 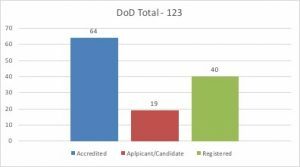 There are currently 59 other DoD agencies that are in the process of becoming accredited. The Department of the Navy supports all the services in obtaining accreditation through a contract with CPSE. The contract supports funding for all component services for training, status fees, books, and peer assessor travel. This type of commitment illustrates their belief in continuous quality improvement and third party verification and validation. DoD’s influence on CPSE’s programs continues with representatives serving on both the CFAI and Commission on Professional Credentialing (CPC). These key positions ensure the quality improvement model for agencies and designees reflect best practices and a continuous improvement mindset for the fire service. While Navy FES is the selecting agency for commissioners they have done an exceptional job of seeking participation and rotating representation from all the service components. The fire chiefs that serve the CFAI and CPC are high-caliber individuals that have risen to the position of commission chair during their tenure. Finally, peer assessors and peer reviewers represent the commissions (CFAI and CPC) in conducting verification and validation of accreditation and designation documents. On all DoD site visits there will always be one DoD peer assessor assigned. Also, these peer assessors go out frequently on civilian site visits as well. Peer reviewers are assigned to civilian and/or DoD designation packages as well. The peer assessor/reviewer process allows fire service members to cross pollinate with agencies across the globe and share great ideas and processes. The Department of Defense plays an important role in the fire service. Their commitment to quality improvement is a model that should be replicated by businesses worldwide. Their importance to CPSE are their contributions and support to accreditation and credentialing. Without their involvement we would not be able to lead the fire and emergency service to EXCELLENCE. 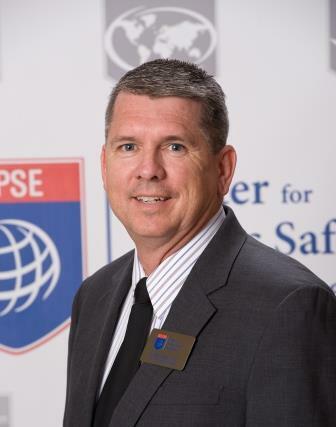 Karl Ristow is currently with the Center for Public Safety Excellence as Program Director for the Commission on Fire Accreditation International. He has over 38 years of fire service experience having served as firefighter through fire chief. Karl is a retired United States Air Force officer having served throughout the world in defense of his country. Karl holds a Master’s Degree in Public Administration, a Bachelor’s Degree in Interdisciplinary Studies, and Associate Degrees in Fire Science and Instructor of Technology. He is a graduate of the National Fire Academy’s Executive Fire Officer Program. He is also a Chief Fire Officer Designee through the Commission on Professional Credentialing and a Member of the Institute of Fire Engineers. Karl is married to his wife Barbara and they have 5 sons.